HP's Spectre x360 x15 convertible improves aesthetically and functionally, as well as under the hood, with features that include a privacy-preserving camera as well as an upgraded processor and GPU. 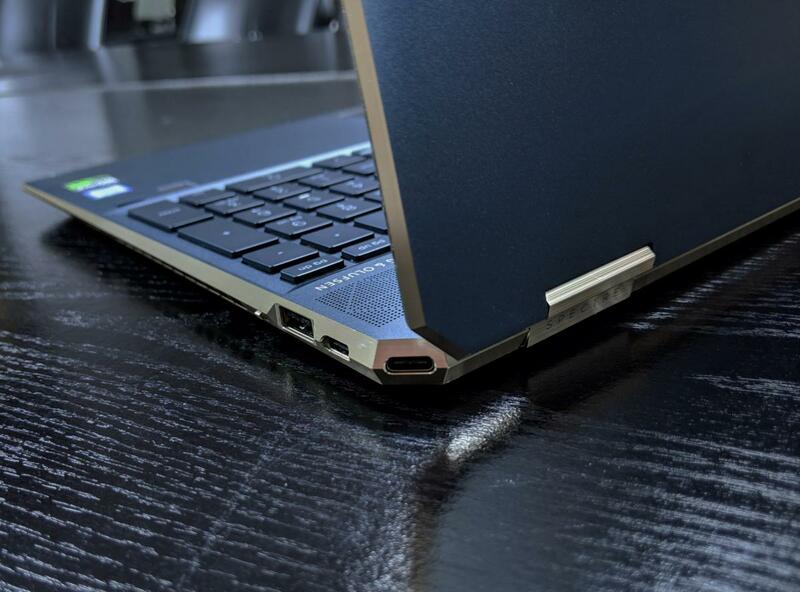 Should you buy the HP Spectre x360 15? 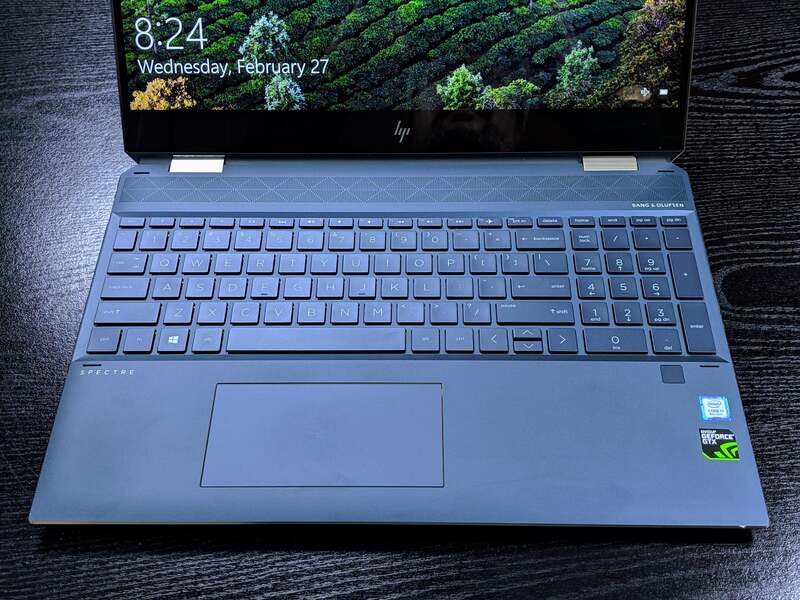 The 2019 edition of the HP Spectre x360 15 convertible has a hard act to follow. 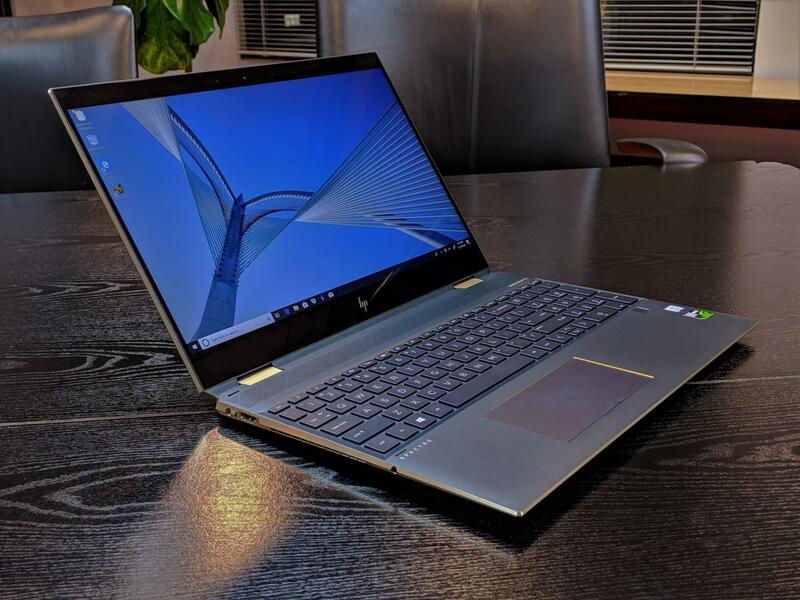 We previously awarded HP’s Spectre x360 15 (2018) an Editor’s Choice award on the merits of its powerful GPU, 4K screen, and solid battery life. This year's model improves both performance and battery life, with a slightly redesigned aesthetic that appears as functional as it is attractive. There is a price to be paid for such power, though. While our review model (15-df0xxx) starts at $1,550 from HP.com, the price jumps to just over $2,000 for our review unit configuration—about $300 more than the price HP charged for our fairly similar 2018 review unit. At 4.62 pounds, the Spectre x360 15 weighs more than you’d expect. And in the ongoing flagship war between Dell’s XPS line and and HP’s Spectre line, the Dell XPS 15 9570 again comes out on top in terms of performance—though with a far less detailed display. It’s also significantly cheaper. As befits a flagship, the HP Spectre x360 15 we tested is stuffed to the grilles with high-end parts. Here are the details. Price: Core i7/GeForce 1050Ti, $2049.99 (as tested), HP.com. A version with a Core i7-8565U and MX150 GPU is $1,599 from Best BuyRemove non-product link. HP’s luxurious Spectre x360 laptop fills the gap between content creation and a true gaming PC. The chassis is made of CNC-machined aluminum, and you now have color choices: Dark Ash Silver with copper accents which cover the laptop’s vertical sides, or Poseidon Blue with similar pale brass accents. Our Blue review unit seemed to accumulate fingerprints and smears quickly, at least on the palm rest. As the name suggests, the x360 is a full 360-degree convertible, flipping easily from a normal clamshell orientation through tent mode into something approximating a tablet. The latter mode, though, is more theoretical than practical, as the laptop weighs a chunky 4.62 pounds—not something you'd want to hold in two hands, let alone one, for long. The HP Spectre x360 15 (2019) flips backward into tent mode. Toting around as a tablet, though, isn’t worth the effort. Note the large bezels, top and bit ottom. The Spectre x360 15 (2019) construction seems sturdy enough, though there was a bit of chassis flex when the laptop’s base accidentally extended off the end of my desk and I tried to type—the base extends about 10 inches deep, after all. Spacious fan vents on the right and left vertical edges pull cool air in and push hot air out. Unlike the Spectre x360 13 (2019), there’s no “quiet mode” control that shuts the fans off entirely. HP says this new Spectre x360 15 features larger dual fans with dual radiators, an IR thermal sensor, and up to three heat pipes. In the real world that means that even under load, the Spectre x360 15 (2019)’s fan noise was relatively unobtrusive, other than some slight whine. Sucking in such a large volume of air also means that the laptop shut down its fans quickly, though they would occasionally spin up softly even when not in use. The Spectre x360 15’s underside never exceeded being moderately warm when using HP’s recommended power settings, which balance performance and heat. There are sizable cooling vents on the HP Spectre x360, which help to minimize the time during which the laptop’s fan needs to be in use. Even after a lengthy stress test, the fan shut off a minute or so later. A microSD slot is also mounted on the side of the chassis. 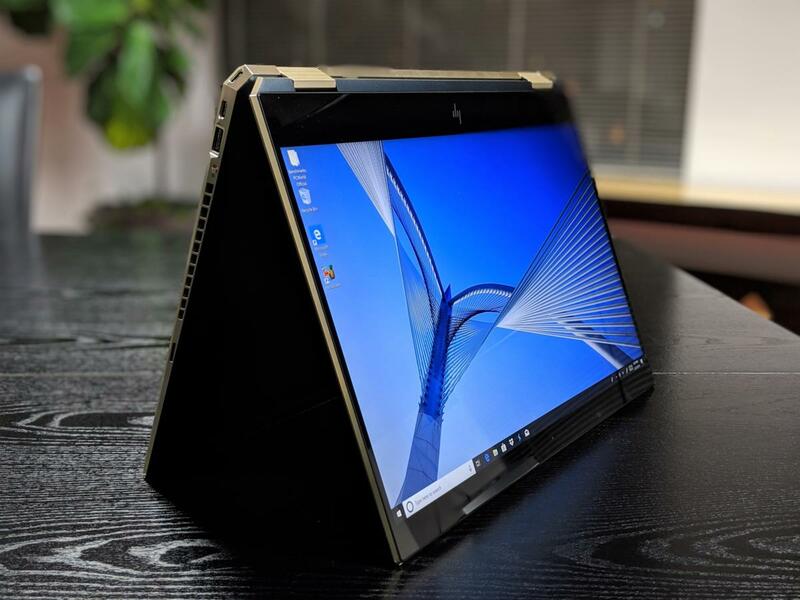 HP says it will offer the Spectre x360 15 with two screen options, each with trade-offs: a super bright, 650-nit 1080p Sure View option, which helps shield your screen from someone looking over your shoulder; and what we tested: a more conventional though still impressive 4K display. Viewing angles are excellent, with little to no loss of brightness when viewed from an extreme angle. However, its 300-nit maximum brightness, while comfortably above the 250-nit threshold that we consider to be adequate, feels a bit spare for a laptop at this price. HP obviously made its decision to maximize battery life. Still, we’d prefer the option of dialing it down ourselves. You’ll also see a rather sizable chin surrounding the screen, though HP says that it’s shrunk by about two millimeters. All told, the bezels have shrunk about 11 percent from the prior generation, HP says, although it’s far from an edge-to-edge screen. Our review unit shipped in Poseidon Blue, with Pale Brass accents. 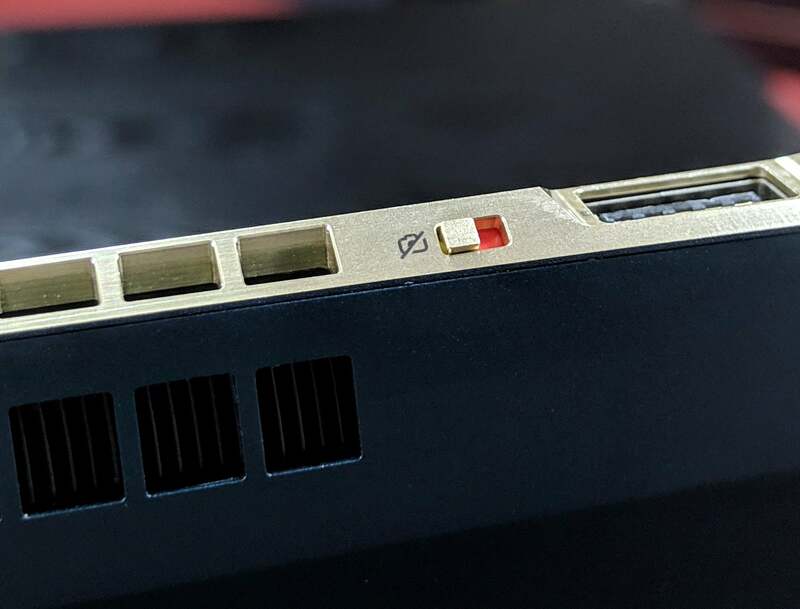 The HP Spectre x360 15 (2019) does not ship with Intel’s 1-watt LPDT panel. The 13-inch Spectre x360 does, however, offering whopping battery life for those who favor it. The most distinctive new visual element on the Spectre x360 (2019) are the angled, “diamond” edges on the rear corners of the laptop. But they’re not just aesthetic improvements—HP tucked the power button on the left rear corner, and a USB-C port on the right rear corner. Even the lower corners of the screen have a similar diamond cutout. The right rear corner’s angled edge neatly accommodates the USB-C port as well as a connecting cable. (Both USB ports support Thunderbolt.) It all fits together nicely. While I’m not convinced that the angled corners offer any functional improvements over side- or rear-mounted ports, I’m happy to cheer stylistic flourishes like this one. If I were to compare the Spectre x360 with its rival, Dell’s XPS laptop, I’d give the edge on aesthetics to the HP Spectre x360. ...and the power button on the rear left corner. The headphone jack and an HDMI port sit alongside. 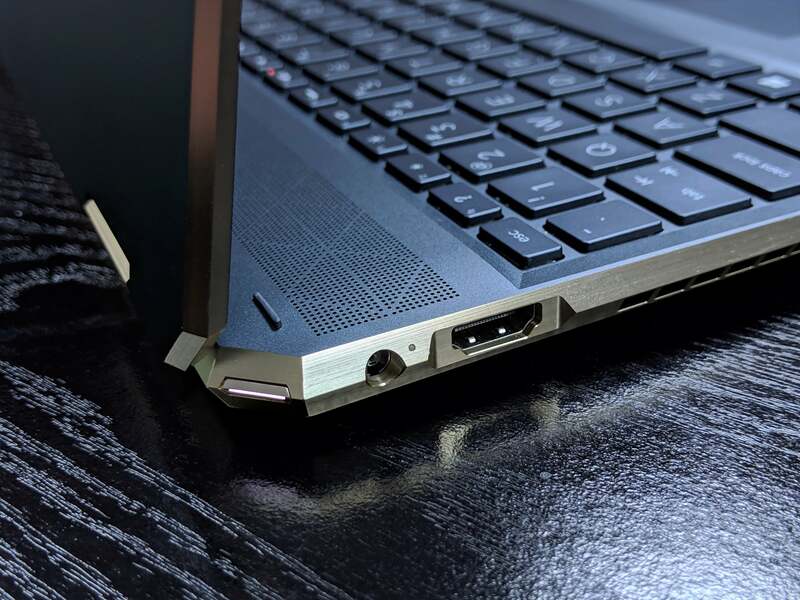 One of the more intriguing features of the HP Spectre x360 15 (2019) is what HP calls its Privacy Camera Kill Switch, designed to disable the webcam when not in use. And when we say “disable,” that’s exactly what we mean: a physical switch on the right-hand edge of the Spectre’s chassis literally removes the Windows driver from Windows, preventing it from working. It even disappears from the list of available devices. When you flip the switch back, the camera returns. When flipped on, the kill switch electrically disables the webcam. It’s a novel solution, and plays into the growing (though possibly unfounded?) concern that hackers may use your webcam to spy on you without your knowledge. Still, we can’t help wondering: Most smart speakers ship with a button that disables the microphone. 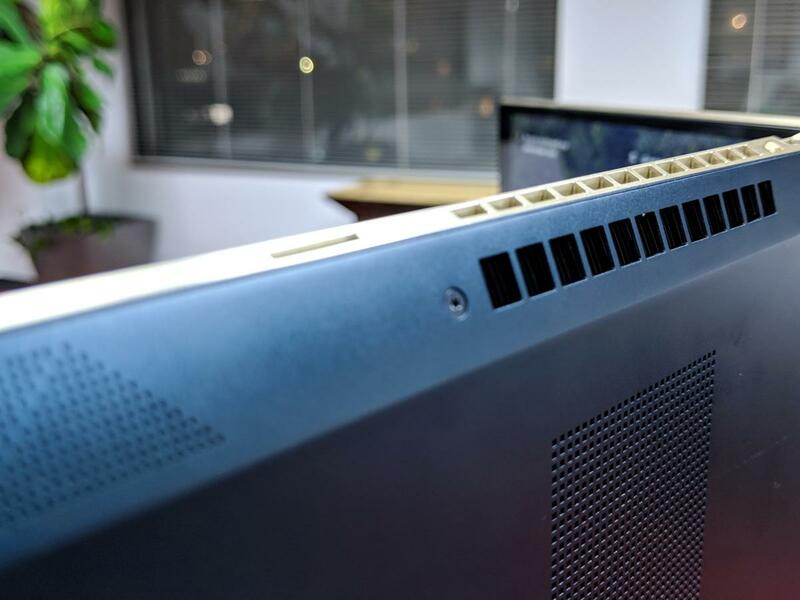 HP’s solution, like the Lenovo Think Shutter and others, leaves the mic up and running. Why? Disabling the camera will also ripple through other apps. Windows Hello will only sense the presence of the fingerprint reader, for example, and Skype won’t think you have a camera available, either. Typing on the Spectre X360 15 (2019) can be a mixed bag. The key travel is a generous 1.5mm, with two backlighting levels, and the feel is springy, without excessive resistance. As a lefty, I was pleased to see HP include a dedicated numeric keypad, as it has previously. (Unlike right-handed gamers who use the WASD keyboard, some lefties use the number pad for keyboard control.) As a result, the backspace key isn’t tucked away to the far upper right of the keyboard, as it normally is. The Insert, Delete, Page Up, and Page Down keys reside there instead. representing a slight change from other keyboard alignments. The Spectre x360’s trackpad is a bit smaller than most, and aligned almost, but not quite, in line with the space bar. Some small, obsessive part of me rebelled against confining my wrists to the left part of the chassis, but it really should make no difference in day-to-day use. For some reason, the fingerprint reader took about a second to record my fingerprint. 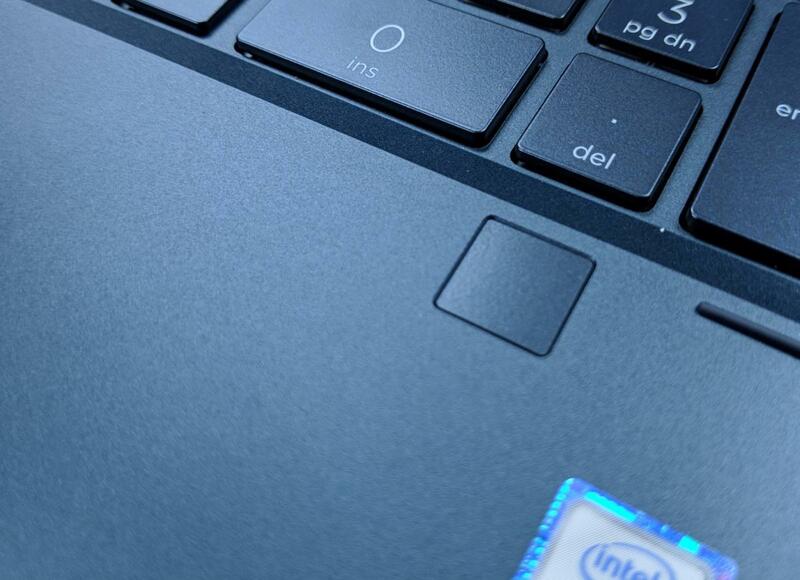 But the Spectre x360’s “wake on fingerprint” feature is very convenient. Though last year’s Spectre x360 placed the fingerprint reader along the side of the chassis, the current 2019 model places the small fingerprint reader near the top of the palm rest. While the Spectre x360’s fingerprint reader didn’t seem as responsive as that within the Huawei Matebook 13, I didn’t notice any accuracy issues in my time with the Spectre x360 15. In my experience, error rates on fingerprint readers can increase over time, forcing you to recalibrate. There’s also the previously mentioned HD-quality user-facing camera, whose IR component is Windows Hello-capable. Turning off the camera via the “kill switch” also disables the Windows Hello depth camera, though the fingerprint reader can be used instead. The redundancy is a thoughtful touch, allowing a user to maximize privacy without sacrificing all the convenience of Windows Hello. One area the Spectre x360 15 (2019) doesn’t shirk on is audio performance. Sound booms from the four integrated speakers. Even rarer, I noticed distinct stereo separation between the right and left speakers. The Spectre seems to push the midrange pretty strongly, somewhat overwhelmingly in parts. On the other hand, one of the test songs I use, Fleetwood Mac’s Go Your Own Way, sounded the best I can remember hearing from laptop speakers. What is it about PC makers' house-brand audio apps that makes controls so difficult to find? 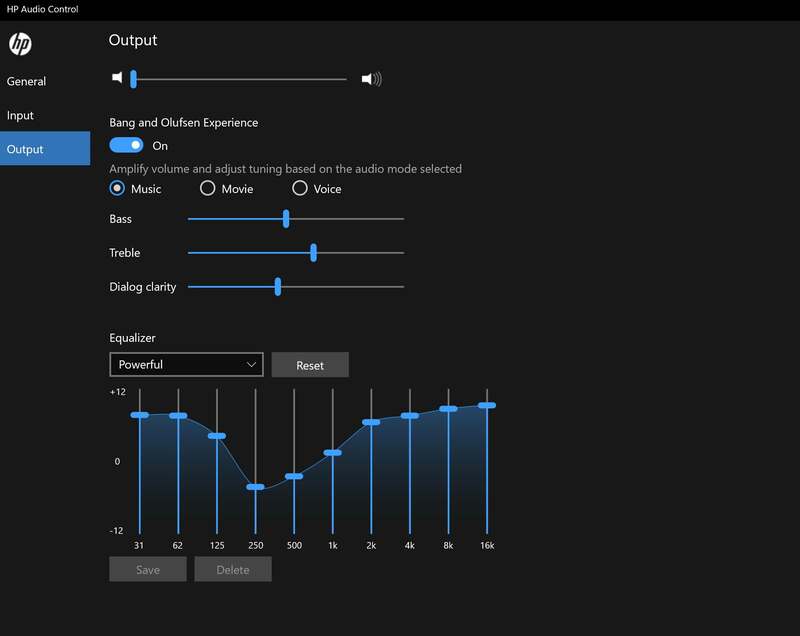 HP’s Audio Control app is no different—there’s no link within Windows’ own Settings menu, so discovering it is almost an exercise in trial and error. HP’s Spectre x360 bundles an HP Pen which inks well, though with noticeable latency before the ink appears. It’s a standard two-button pen; by default, one button is used to select text or other objects, while the bottom button erases. Unfortunately, erasing with the nib never works all that well. The Spectre also lacks a holster or slot to store the pen, so good luck trying to keep track of it. The included pen uses a standard AAAA battery; HP also offers an HP Tilt PenRemove non-product link with a rechargeable battery for $79.99. 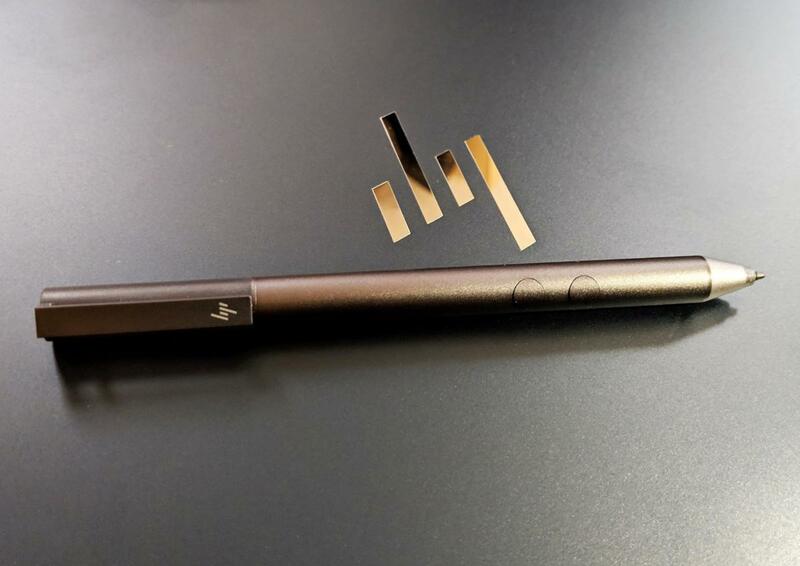 HP includes a pen with the Spectre x360 15, but no place to store it. A significant amount of bloatware ships with the HP Spectre x360 15. Several HP apps, including the HP Audio Control app and HP Command Center, provide useful controls to adjust performance and other settings. HP ePrint tracks your printing orders. 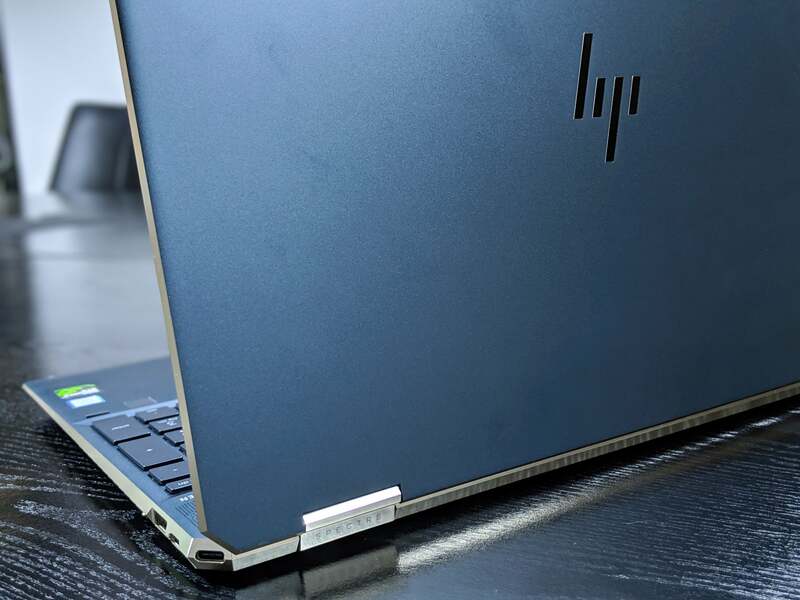 HP JumpStart offers tips and tricks, and HP Pen Control allows you to assign actions to the pen buttons. There’s also the usual complement of Windows bloatware: two Candy Crush games, Fitbit Coach, and more. A Dropbox promo offers 25GB of space free for a year, however, and a year’s subscription to McAfee LiveSafe is also included. HP positions the Spectre x360 (2019) as a device for “creative enthusiasts,” such as amateur or professional photographers or video editors. HP said it’s trying to shoot for a middle ground between those who might need graphical horsepower and those who might use the Spectre x360 for more traditional drawing apps, hence the pen. HP's Spectre x360 15 (2019) convertible improves on the 2018 model in both performance and battery life, with a slight redesign and a new privacy-preserving camera.